What Happens When The Earth Collapses Beneath Your Feet? 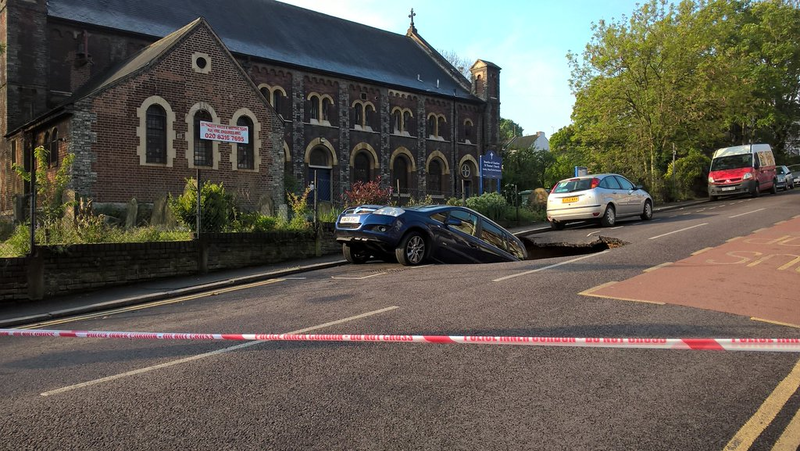 Residents of Woodland Terrace in Charlton, south-east London, had a surprise last month when they woke to find that a large portion of their street had simply collapsed. The crater, estimated to be more than 30 feet in length, 10 feet wide and 10 feet deep, appeared in the early hours of the morning following severe storms and more than 24 hours of torrential rain. Some residents reported hearing a ‘loud bang’ but, due to the weather, they attributed it to thunder- until that is they looked outside the next day. Thanks largely to the late hour, there were no casualties, but the hole did swallow a 7-seater Vauxhall Zafira which had been parked by Ghazi Hassan who was visiting his brother overnight. When he emerged in the morning, the rear wheels were at least ten feet below the surface of the road and only its front end was visible. After one failed attempt, the car was eventually recovered from the hole by a large crane – and surprisingly had little damage to show for its adventure. This is not the first sinkhole in Britain, and they are surprisingly more common than you might think. In fact, there has been a small spate of spontaneous craters across the UK over the past couple of years, including a hole reaching 40 feet deep on a busy road in Manchester city centre, one that caused £16,000 of damage to the fairway on Traigh Golf Course on Scotland’s west coast, and a huge crater in St Albans that caused the evacuation of a whole street. Further afield in America, the phenomenon is even more common, particularly in areas of Texas, Alabama, Missouri, Kentucky, Tennessee and Pennsylvania. In Florida, sinkholes happen so frequently that insurers are legally obliged to offer cover to those homeowners who ask for it. So, what causes sinkholes and are you at risk? There are two main types of sinkholes – man-made and natural. Man-made craters are generally caused by the collapse of disused mines and tunnels. In contrast, natural sinkholes are created when acidic rainwater drains down through surface soil and sediment to the carbonate rock or soluble bedrock below. Over the years, the water dissolves parts of the rock, creating cavities. As this progresses, the soil and sand above washes into these cavities and, eventually, the surface layer will no longer be able to sustain its own weight and will simply collapse. There are number of areas in the UK that are more susceptible to sinkholes. The limestone found in the Yorkshire Dales, the Mendip Hills and parts of the Lake District is the ideal breeding ground for sinkholes, as is the chalk of south-east England and the gypsum found around Ripon and Darlington in north-eastern England. The good news is that, although sinkholes are fairly common, fatalities are extremely rare. If you do live in a sinkhole-prone area, there are things you can watch out for which could signal the onset of a ground collapse. These include water collecting in unusual places, sagging trees or fence posts, and doors or windows that won’t close properly. If caught early enough, some potential sinkholes can be filled in before they collapse, although good drainage is essential to the success of such an operation. It’s not always possible to predict when a sinkhole will occur, but what is certain is that sinkholes are particularly affected by extreme weather such as long periods of drought followed by heavy and persistent rain. So, as climate change progresses and extreme weather events become more common, we can expect to see more and more incidents such as the one in Charlton last month.